The UBC2001 is a very compact, highly portable, block calibrator designed for checking the accuracy of temperature sensors, thermometers and thermostats. It offers compact size, low cost, and versatility. 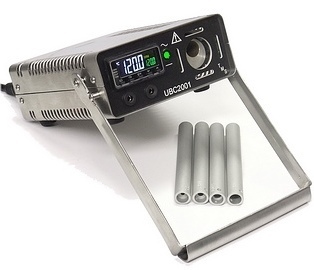 The UBC2001 is constructed with an aluminium block with a main well (hole/pocket), which takes interchangeable sleeves in a wide range of popular probe sizes. It also features a test circuit and buzzer for accurately checking thermostat switching temperatures.